Each winter from late December until mid-March, several species of whales visit Chesapeake Bay near Virginia Beach, Virginia, as part of their annual migration route to warmer waters, including the humpback and fin whales. If you're visiting during the migratory season, you can book a two-hour boat tour from the Virginia Aquarium for your chance to spot these magnificent creatures in the wild. Fortunately, the likelihood of spotting one or more whales is pretty high throughout the winter; however, sightings can vary from year to year depending on weather patterns and can be hard to predict. The Virginia Aquarium & Marine Science Center, located in Virginia Beach, offers education-based Winter Wildlife Boat Trips each year from December through March that explores an array of interesting winter wildlife visitors and residents in the Virginia Beach and Chesapeake Bay area. During these two-hour trips, knowledgeable Virginia Aquarium educators help spot harbor seals, harbor porpoises, and whales. In the sky, guests may see aerial shows of nature as brown pelicans, northern gannets, double-crested cormorants, and other sea birds soar and dive into the water to feed on schooling fish. While you're keeping an eye out for wildlife, onboard educators teach about the various creatures found in these waters. Lessons include discussions about annual migration habits, current conservation efforts for these wondrous and endangered creatures, and.the differences between harbor porpoises and bottlenose dolphins. The boat trips take place on a 65-foot catamaran, Rudee Whaler, which features a heated cabin and outdoor seating on upper and lower decks. Hot beverages may be enjoyed along the way. 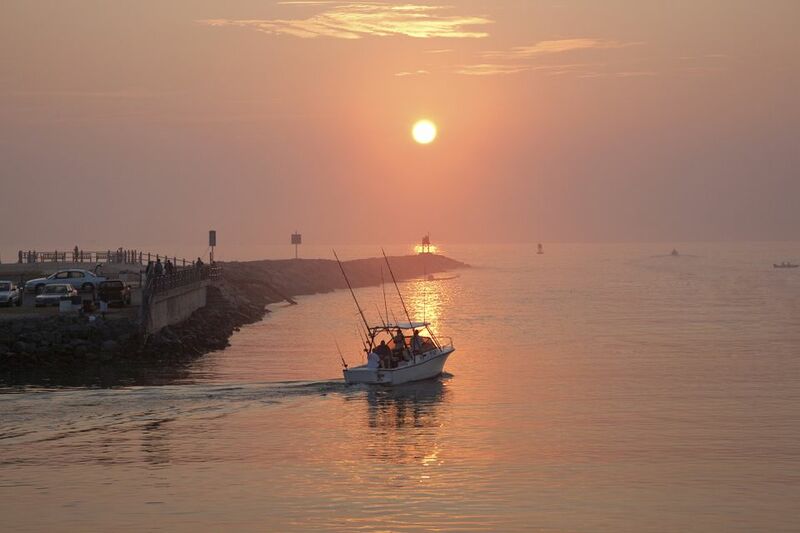 Boat trips leave from the Virginia Beach Fishing Center at Rudee Inlet, located at 200 Winston Salem Avenue, Virginia Beach. Charter trips are available upon request. For additional information and to make reservations, visit the Virginia Aquarium & Marine Science Center website and click on "Educational Adventures." A number of sea creatures spend the winter migrating south along the Atlantic Ocean to hunt for food, reproduce, and raise their young in warmer climates. Among the species of whales and wildlife you may encounter on a boat trip, humpback whales, bottlenose dolphins, and fin whales are the most common, but you may get lucky and spot minke whales, harbor porpoises, harbor seals, or the critically endangered right whales, too. The majestic humpback whales follow a migration route that originates in the Bay of Fundy and brings them to the coastal waters near the shores of Virginia Beach. Known for their complex and lengthy whale songs, graceful athleticism, unusual bubble net feeding techniques, and immense size, humpback whales are among the most fascinating and thrilling whales to observe. On the other hand, the fin whale is second in size only to the blue whale and is the second largest animal on earth. Long and streamlined, fin whales are known for their great speed capabilities and powerful, low-pitched sounds. Both the humpback whale and the fin whale are listed as endangered. The number of annual migratory whales in the Atlantic waters near Virginia Beach is being studied through ongoing research, including periodic aerial surveys. Additional research is required before scientists will be able to provide an accurate estimate of the number of whales that migrate past Virginia Beach annually. However, because the migrating whales move freely in their natural ocean habitat, the likelihood of seeing whales during a winter visit to Virginia Beach varies from year to year, ranging from excellent to slight. In the past, some years have yielded a banner number of sightings with as much as a 90 percent success rate, while in other years the whales have been far more elusive with a success rate of 40 to 50 percent. Before making your final plans, confirm your boat trip details. In some cases, boat trips may be canceled because of weather conditions that affect safe boating. Remember that winter weather conditions along the coast are frequently windy with slightly colder temperatures out on the water. Wear warm clothing, including waterproof jackets in case of rain as well as hats, gloves, and scarves, and dress in layers so you can make adjustments as necessary for a variety of conditions. Wear non-skid shoes and warm socks. Remember to pack your camera and binoculars. Take a pair of sunglasses in case you have a bright, sunny winter day. Seek medical advice before planning your trip if you are prone to seasickness. Make the most out of this interesting adventure, even if you do not manage to see everything that you had hoped to see. If you miss the whale-watching season, the Virginia Aquarium also offers a number of other boat adventures throughout the year including the Dolphin Discoveries Tour in March, April, and May.